Established in 1811 by Western Quarterly. The initial meetings under Fallowfield were Fallowfield Preparative and Doe Run Preparative (also known as Derry Meeting). The Orthodox branch of this meeting was laid down in 1838 and its members were attached to the Orthodox London Grove Monthly. The Hicksite branch of this meeting continued to meet in the meeting house of the Fallowfield Preparative meeting. Component meetings added after the Separation were Homeville Indulged and Homeville Preparative (also known as Oxford during this period). At the time of the Great Separation the Hicksite portion of the Fallowfield Preparative meeting had retained the orignial grounds and meetinghouse and the Orthodox faction met unitl 1841 in the original log structure that had been erected in 1794. 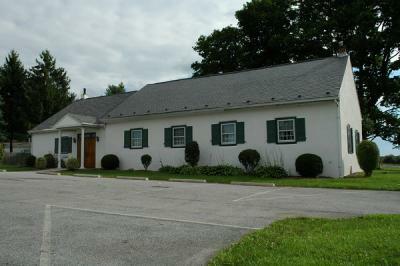 IN 1841, they purchased a lot on the northern side of Ercildoun and erected a small meetinghouse. A burial ground that remains to this day was also established. The meetighouse itself is gone and the property is now in use by another religious organization. Theburial ground remains, surrounded by a sturdy stone wall. Doe Run and Buck Run Roads, Ercildoun, Chester Co. PA Set up in 1796 by London Grove Monthly after having been established as an Faloowfield Indulged meeting under the care of New Garden Monthly from sometime prior to 1792. Early meetings were held in the home of George Welsh until 1794 when an acre of land was purchased and a log meeting house erected. In 1797 an adjoining acre of land was purchased from Matthew Welsh, followed by 107 perches of land purchased in 1814 from Thomas Welsh. In 1801, a one story brick meeting house was built a short distance from the original log structure.